Finally, We Get a Picture of Our Mom Laura Dern in Little WomenFinally! Issa Rae, Laura Dern Go Toe-to-Toe Over Cabbage Patch Dolls in HBO’s The DollsThe limited run series is based on the so-called Cabbage Patch doll riots of 1983. You Know Who Really Hated That ‘Popular Film’ Oscar? Some Guy, Steven Spielberg!He was “uncomfortable” with the idea. Laura Dern Might Join Little Women, Hollywood’s Biggest Actress Crossover EventMarvel is shaking. How Wild at Heart Led to Laura Dern’s Incredible Performance in The TaleDern gives a standout performance in The Tale; it’s easy to trace it back to Lynch’s film, the moment her career shifted. The Tale Is a Nuanced Memoir of Sexual AbuseWith the word abuse I fear I’ve already misrepresented director Jennifer Fox’s complex ambitions. The Laura Dern-aissance Continues With This Trailer for The TaleThe Tale premieres May 26 on HBO. The Tale Teaser: HBO Brings Laura Dern’s Sundance Standout to TVThe film will air on May 26. Laura Dern Is Living Her Best Life This Holiday Season With an NBA PlayerThe Year of Dern knows no end. What Carrie Fisher and Princess Leia Meant to the Women of The Last Jedi“[She was] without shame,” said Laura Dern. Laura Dern Fangirling About Meeting Chewbacca Will Make Your DayHe smelled great. Laura Dern Shares Another Photo of Space Laura Dern, Her Star Wars CharacterThis mauve hair! You Should See Laura Dern Wearing a Badass T-Shirt With Her Face on ItEnjoy! 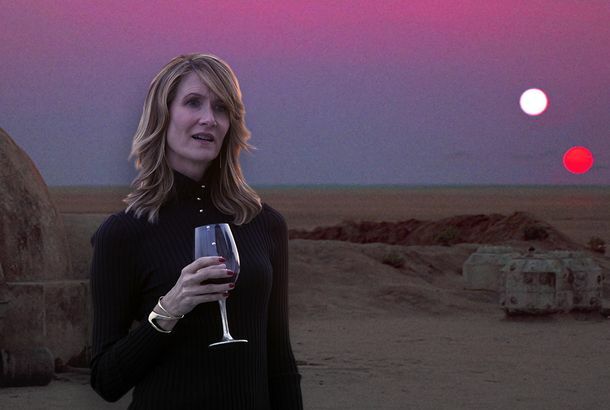 Finally, We Know More About Space Laura Dern in Star Wars: The Last JediShe’s very pink. What Laura Dern Would Sound Like As Your Mom in the F Is for Family S2 TrailerLaura Dern is your mom. Bill Burr is your dad. Beyond Big Little Lies: The 11 Greatest Laura Dern RolesFrom Blue Velvet to Wild, she is one of Hollywood’s most fascinating actresses. Honestly, How Dare Star Wars Not Show Us Laura Dern in SpaceImagine, for a moment, that you possess footage of Laura Dern in space. Would you keep it to yourself? Remember Reese Witherspoon and Laura Dern’s Glorious Big Little Lies Press TourWhat a ride it was. Laura Dern’s Mom Is Mad That She Was Mean to Reese Witherspoon on TVOur new favorite celebrity-BFF duo. In Wilson, Woody Harrelson Is a Utopian MisanthropeThe film is a brusque, foulmouthed character study. 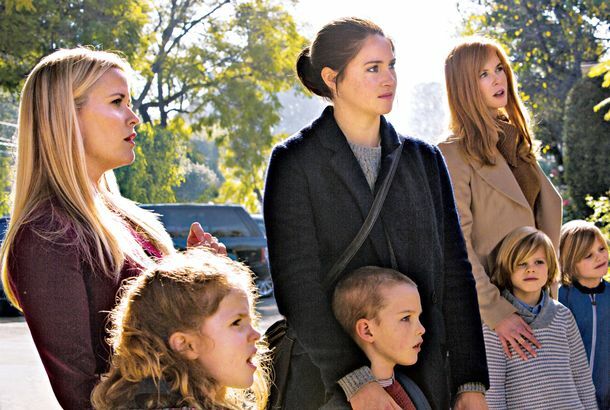 Big Little Lies Is All Surprise, No SuspenseBut it’s still a must-see thanks to extraordinary performances from Nicole Kidman, Reese Witherspoon, Laura Dern, and Adam Scott. Movie Review: Certain WomenThe director takes titanic emotions and frames them in un-titanic ways, here in long, seemingly uneventful shots. Certain Women Trailer: A Quiet Emotional JourneyVery quiet. HBO Developing Show With Alex Gibney, Laura DernLet’s hope it’s enlightening. Seitz: Enlightened’s Heroine Is Still Deranged, But Not Totally Wrong The HBO comedy’s second season is brilliantly nuanced. Jesse Plemons Cast in P.T. Anderson’s Scientology MovieLandry! HBO Says Yes to Mike White’Enlightened’ gets picked up. Laura Dern Is FockedPlus: Rock of Ages! Mia Hamm! Modern Love! Big Mama’s House Series to Be a TrilogyPlus: Mike White gets a green light! Jonah Hill’s ‘21 Jump Street’ Movie to Be Totally Sweet, Unless It SucksPlus: Laura Dern on playing Katherine Harris, and Josh Groban on playing John Mayer. Van Halen Reunites!Amy Winehouse, Harry Potter, and more!